Apparently we're having a month full of platformers here at SuperPhillip Central! We don't know about you, but seeing as we love platformers, we're okay with this! Our next review is a game we didn't think we'd like, but it ended up being rather good. 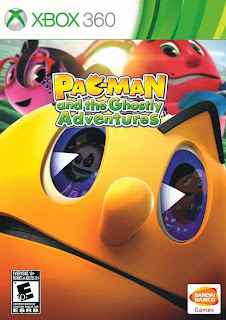 It's Pac-Man and the Ghostly Adventures for Wii U, PS3, PC, and Xbox 360. Pac's Back, and That's the Fact, Jack! 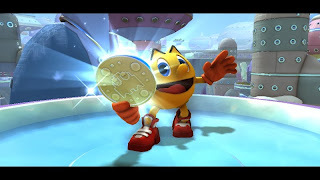 Pac-Man has been Namco's main mascot for quite a good while now. His arcade exploits still remain his most popular games. 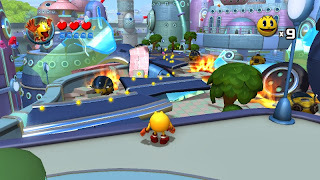 However, recently Pac-Man has appeared in several platformers and even some party games, attempting to allow him to branch out like other game mascots have in the past. His latest platforming romp just debuted on the Wii U, PlayStation 3, Xbox 360, and PC a few weeks ago, Pac-Man and the Ghostly Adventures. Pac may be back, but is that a good thing? Not having ever seen the actual show this game is based off of, I was bewildered as to why Pac-Man was hanging out in high school with his former otherworldly ghost rivals, Inky, Pinky, Blinky and Clyde. 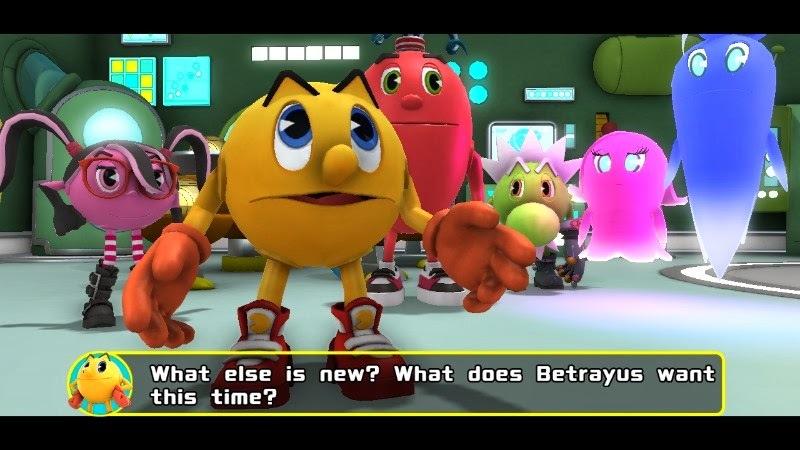 Regardless, the simple story has a sinister ghost and apparent nemesis to Pac-Man, Betrayus, wanting to turn PacWorld into a ghost's paradise. Pac-Man is on the job to help defeat Betrayus once more and in the process save PacWorld and its slew of denizens. If you can get over the cheesy voice work and nothing that special dialogue, you'll find a kid-friendly tale that doesn't impress or surprise. It's just there, but it's serviceable, as plot is pretty much meaningless in a platformer, serving only as an excuse for all of the running and jumping that proceeds afterwards. Apparently, Betrayus just wants an Xbox One. 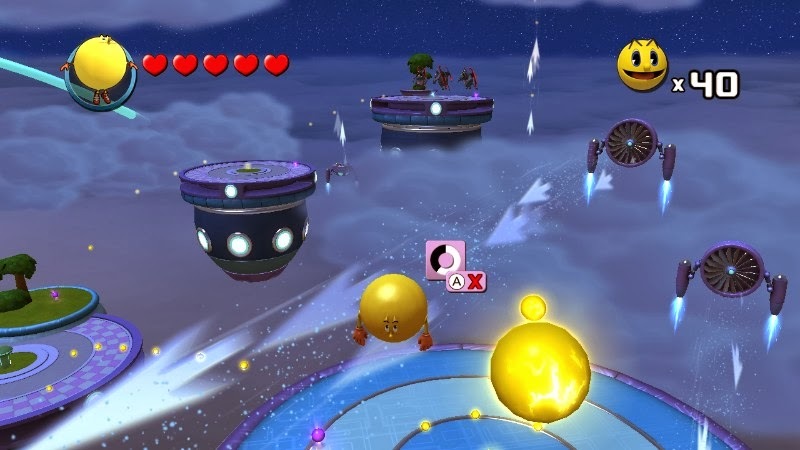 Pac-Man and the Ghostly Adventures is your standard 3D platformer with some exceptions. One of those exceptions comes later in this review. 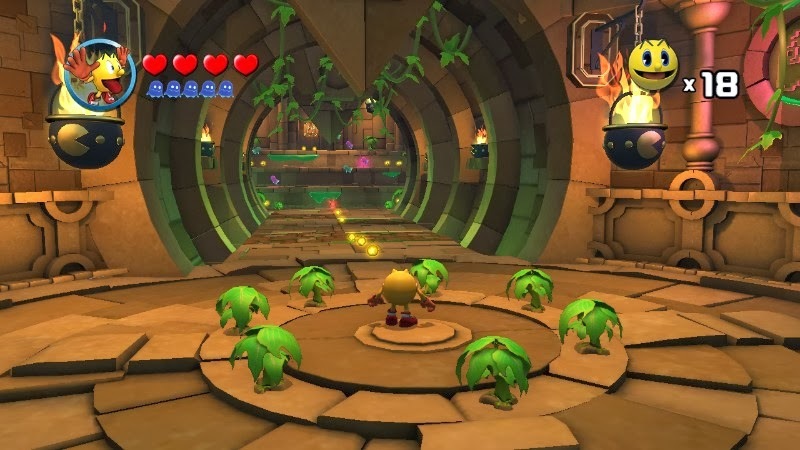 Regardless, Pac-Man goes around the various linear 3D environments, gobbling up Betrayus' minions, collecting power pellets, and searching for hidden items like arcade tokens and items that increase Pac's health when enough have been collected. There are ample checkpoints to make repeated deaths not so frustrating. and needs your help, Pac-Man! 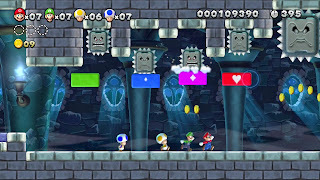 Levels are relatively well designed, offering new tricks as the game progresses. My favorite world of the game happens fairly early. It is a ruins world where you transform into a ball and roll through an obstacle course full of platforms, enemies, and places to fall off. It reminded me heavily of Super Monkey Ball in some regards. 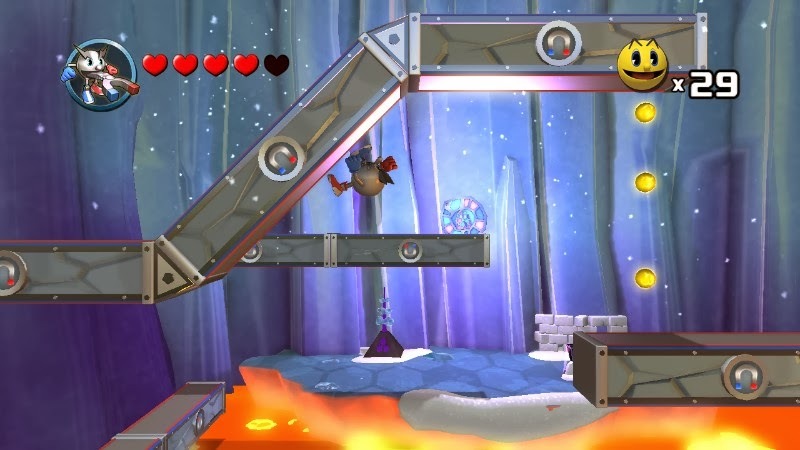 Another level in the ruins turns Pac-Man into a bouncy ball, allowing him to jump back and forth between nearby walls to reach greater heights. This gets more challenging when the walls you have to jump off of move in and out of the way or can even crush you like a tin can. how many other people licked that same pole! 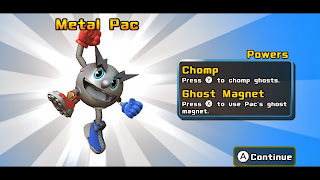 To set Pac-Man and the Ghostly Adventures apart from other games in the mascot's history, and to other platformers in general, is the inclusion of different power pellets that turn Pac-Man into numerous forms. 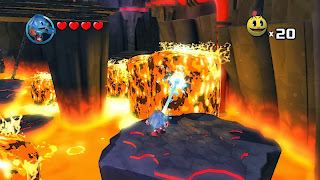 One can fling fire to light torches and burn enemies, one can freeze fountains to create platforms. 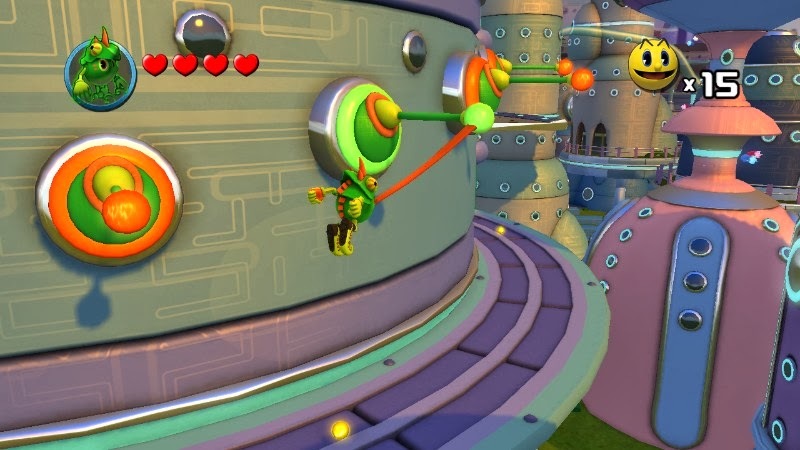 The chameleon form not only allows Pac-Man's tongue to serve as a grappling hook to be used on specific poles to cross chasms, but it can also turn our yellow ball of fun invisible, great for not being detected by enemies. One of the cooler forms Pac-Man can turn into is Metal Pac, granting him the ability to walk on top of and under special magnetic platforms. Just like with the level design, these Pac-Man forms bring some needed creativity into the mix. There are optional bonus levels to take on in Pac-Man's latest. These are the most difficult (and I use that word loosely) parts of Pac-Man and the Ghostly Adventures. They generally involve particular platforming challenges, occasionally with a high focus on one particular Pac-Man form, and feature no checkpoints to speak of. One has Pac-Man needing to inflate himself like a hot air balloon. Then he can exhale to push himself towards air currents that will send him floating to faraway and/or high-up platforms. an inflated opinion of himself. While these levels are the most challenging aspect of Pac-Man and the Ghostly Adventures, they never get frustrating, nor do the regular levels. When I died in a level, the only thing to blame for my demise was myself and not the game. Pac-Man and the Ghostly Adventures quite possibly has the tightest and most responsive controls of any of his platforming jaunts, so I never felt out of control, even with the more precision-based power-ups in play. Even when chomping ghosts, Pac-Man would effortlessly move from gobbling up one nearby ghost to the next, never missing a beat. Additionally, the camera never gets caught on geometry, and it can be moved at any time via the right analog stick. All in all, the gameplay is surprisingly mechanically sound in this game. turning them temporarily into platforms. However, one questionable design choice was the decision to make the player complete a level twice to fully complete it. On the first time around, Pac-Man receives a fruit of some sort, which he happily gobbles down. The second time around, Pac-Man receives an arcade token to be used on one of four unlockable mini-games. I can't help but wish that there was something completely different rather than going through the same stage twice. Perhaps the return trip to a given level would have Pac-Man racing against the clock to reach the end of the level before time runs out. Anything would be better than what currently is in the game, which comes off as just laziness by the developers. Another issue with the game is that it is quite short. My play-through, which included completing some levels twice, as well as finishing all bonus levels, lasted me about six hours. Now, I haven't done everything there is to do in the Ghostly Adventures, but the rest won't take that much longer. I understand the game is at budget price, but six hours for forty dollars isn't exactly the most enticing offer. you to rack up lives. Pac-Man and the Ghostly Adventures looks rather nice and runs rather well at least on the Wii U, the system this review is based off of. Characters and areas are brimming with color, and the game generally doesn't suffer much in the way of slowdown, even with countless ghosts parading on the screen, rather in an actual level or serving as a background sight. The music isn't such that you'll remember each theme long after you play the game, but it gets the job done and fits all levels and boss fights. I was incredibly ready (perhaps even all too eager) to write off Pac-Man and the Ghostly Adventure for several reasons: 1) I didn't enjoy Pac-Man World much at all, and this game reminded me of those games, 2) It is based off a cartoon series. However, I gave the game a chance, and I ended up being pleasantly surprised. There is good amount of creativity in the level design. Some levels are better than others, sure, but all are enjoyable to play. While many could paint Pac-Man and the Ghostly Adventures as a by-the-numbers type of platformer, I find it refreshing in a generation where first-person shooters and Hollywood wannabes seem to be so popular these days. 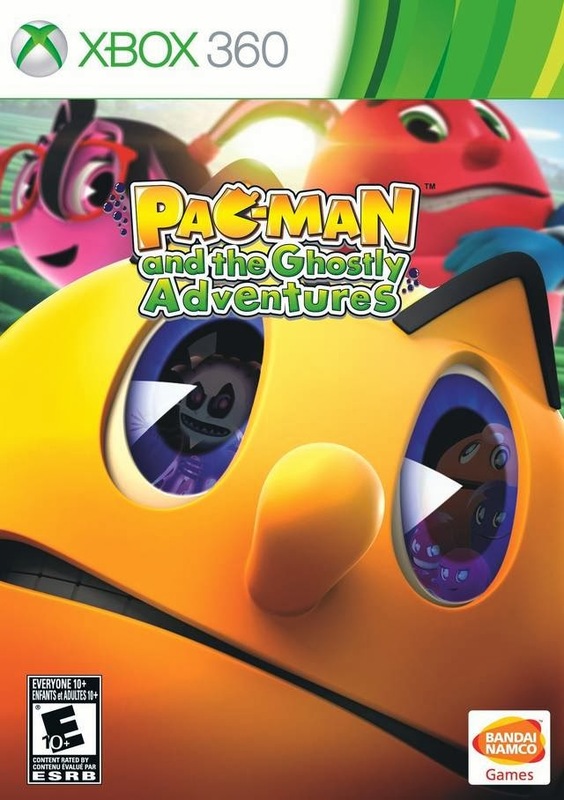 Pac-Man and the Ghostly Adventures isn't the most remarkable 3D platformer, but its mechanics work and work well, and there is just enough entertainment you can get from the game to make it worth a try. The creator of SuperPhillip Central has a passion for level design. Every facet of it fascinates him, from the aesthetics to slowly but steadily adding new mechanics to keep each level feeling fresh and interesting. It's no wonder that he started this series of articles, Best Levels in Gaming History. We've reached volume nine, and we don't feel the need to call it quits any time soon! On this edition of Best Levels in Gaming History, we take a look at a series of true classic games like Donkey Kong Country, Super Mario Bros. 3, Sonic the Hedgehog, and Mega Man X. 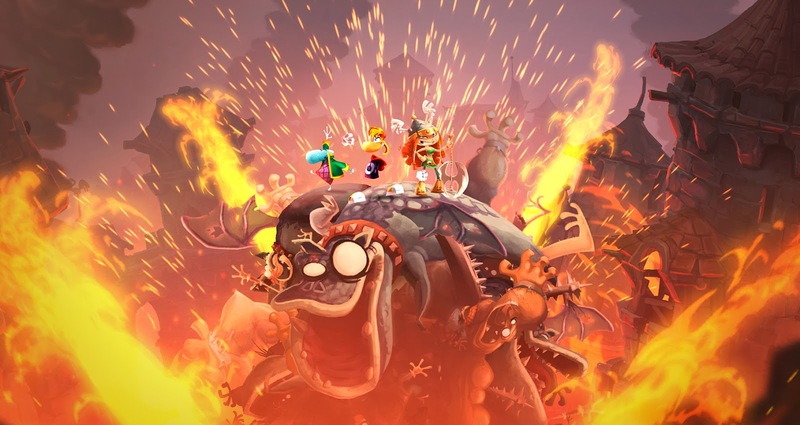 However, we also dabble in a more recent title in the form of Rayman Legends. We hope you enjoy our next level picks. If you have your own favorites, please comment and tell us about them. And if you have missed a previous volume, here's all of the eight preceding articles to get you caught up! 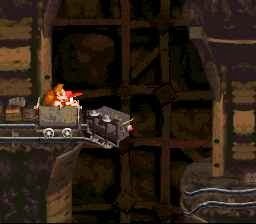 After going through multiple levels that tested your platforming mettle, Donkey Kong Country throws a screwball into the mix in the second area of the game with Mine Cart Carnage. 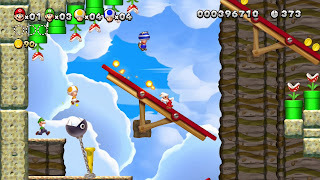 For this level, your timing, precision, and platforming skills are put to the test. 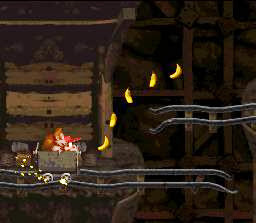 Donkey Kong and Diddy Kong ride inside a mine cart and are required to make careful leaps with the cart over various chasms, idle mine carts, and enemies. You have little time to react to the upcoming perils, so being on your toes is heavily recommended. The track is full of hills, making it one heck of a roller coaster ride, only we don't think it would be passed for inspection by the folks at Six Flags or Disneyworld. Anyhow, the first half of the level is relatively easy, though it still requires your attention. There's a lot of holes within the track, needing you to leap over, some one right after the other. 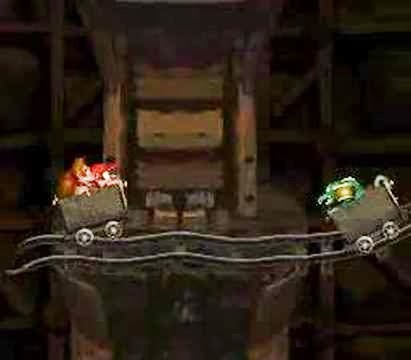 By the time the second half of the level begins (after the continue barrel has hopefully been smashed), the level introduces the aforementioned idle mine carts that mostly lazily lay at the edge of the track next to holes. The final challenge is one that most players first entering the level will probably get surprised by-- Kremlings riding in their own mine carts, riding full stop in your face. 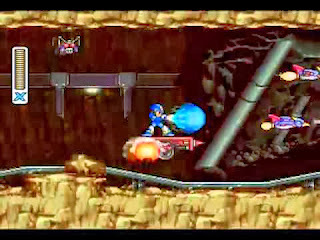 The last portion of the level features several multiple tricky jumps with laying mine carts, big gaps-- one right after the other. Just when you think it's safe to release a sigh of relief, a final Kremling-filled mine cart is needed to leap over to complete the level. It is absolutely humiliating to be put into a false sense of security only to be hit by the final obstacle in the level, right before the end of the level! 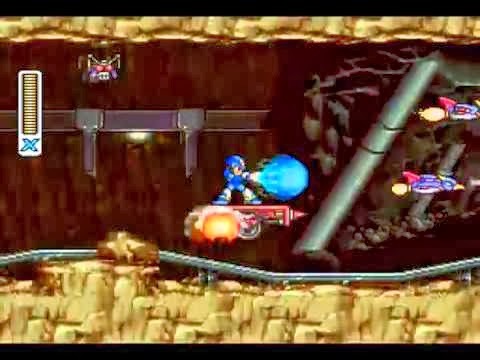 One of the best levels in Mega Man history occurs within a mine. Hm, the last level we featured also took place in a mine. What a wonderful segue! Regardless, Armored Armadillo's stage starts off in fine and fast fashion. You can ride a platform on wheels that speeds down an incline, zooming past the sleeping robotic bats that wish to ambush you. (Though one of these bats always gives the player an extra life when defeated, so the ride might not be worth it. It's also a great place to stock up on health.) You need to leap off the moving platform at the end of the line, or else you'll fall into a pit. 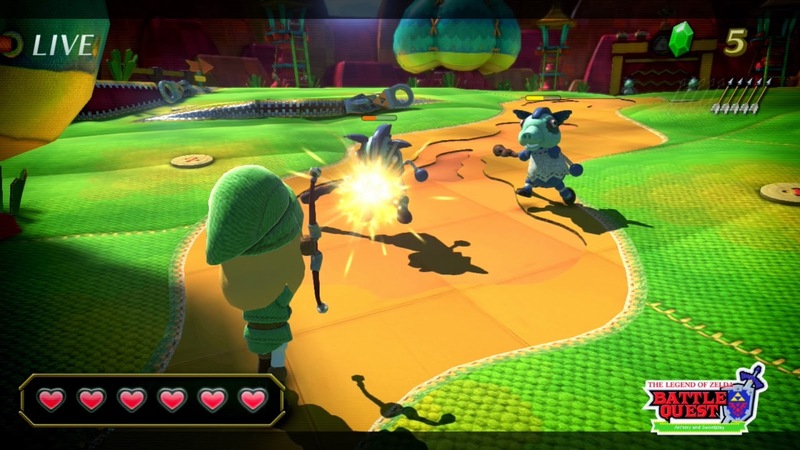 Two parts of Armored Armadillo's level includes a burrowing machine that uses its spike-filled arm to clear the path in front of it. Even touching this arm will destroy Mega Man X. Moreover, allowing the machine to stay alive will allow it to destroy platforms that X needs to reach hidden goodies. You can actually fall down behind the enemy and blast it from behind to ensure that it won't take out any needed platforms. The final portion of the stage is an absolute rush. 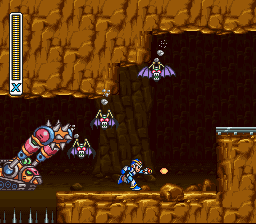 You ride on a final wheeled platform, destroying enemies that foolishly stand on its track, have robotic birds take flight along your side, and get blasted off outside of the mine, over a huge bottomless pit. Leaping at the right time takes you to the boss's door. However, this level also holds a secret capsule at the end. Through going through the appropriate steps, X can learn Ryu from Street Fighter's Hadouken move. This move can only be used when X is at full health, but the payoff is that it kills anything in one nice, clean hit. With Super Mario 3D World releasing this Friday in North America (and the Friday after that in Europe), we figured we'd take a look at one of the most popular levels in one of the most popular Mario games. 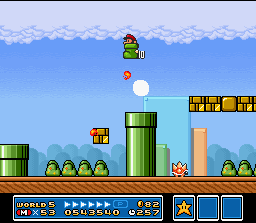 World 5-3 in Super Mario Bros. 3 takes place in Sky Land. 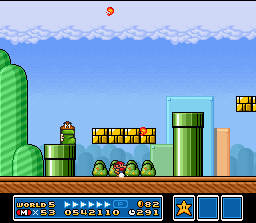 However, Mario and Luigi are still grounded in the first half of this fifth area of the game. The level is rather curious, as at the start you enter a pipe that takes you to the first main stretch of the stage. It's curious because you have to move right-to-left instead of the traditional left-to-right. That isn't what makes World 5-3 memorable, though. 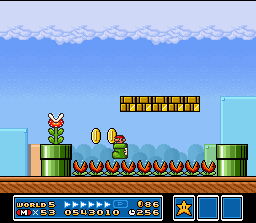 No, what makes the level memorable is a one-off item that you can utilize throughout the entire level, Kuribo's Shoe. 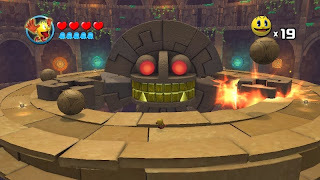 When a Goomba riding inside one is defeated, it is free for Mario or Luigi to enter. It can hop along otherwise dangerous Piranha Plants and hop around so elegantly in the process. By itself the level is well designed, but with Kuribo's Shoe, the level goes from ho-hum to wow-y-wow! The fact that Kuribo's Shoe is only seen in World 5-3 makes the level even more cherished by those who play it. 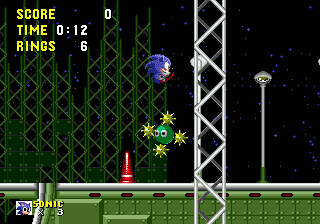 After having to deal with the high challenge of the Labyrinth Zone (and the repeated drowning jingle that most will typically hear again and again), and before the perils and many death traps in the Scrap Brain Zone, Sonic and the player get a bit of a reprieve with the gorgeous and dazzling Star Light Zone. Not only does it have chill music, but it also features a variety of obstacles that make the three acts of the zone enjoyable to play. 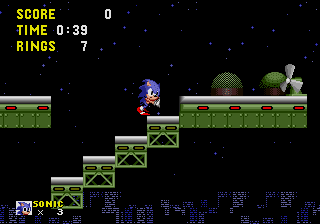 There's several notable features about the Star Light Zone: blocks that shift into staircases when walked on, fans that blow Sonic backward, and see-saws that require Sonic to jump on one end to make the bomb on the other end fly into the air, and move to the other end for when the bomb lands where Sonic once was, shooting Sonic into the sky. Then you have enemies like the Orbinaut, a foe surrounded by four spiked balls that throws them when Sonic is near. In addition to that annoying foe are bombs that go off when attacked or when they self-destruct, showering the nearby area with hazardous fire. The Star Light Zone is one of the most enjoyable levels in the Genesis/Mega Drive era of Sonic the Hedgehog, and we always believe it's worth the trouble of going through the much dreaded Labyrinth Zone to reach it. By far the coolest levels within Rayman Legends are unlocked at the tail-end of each painting (world). 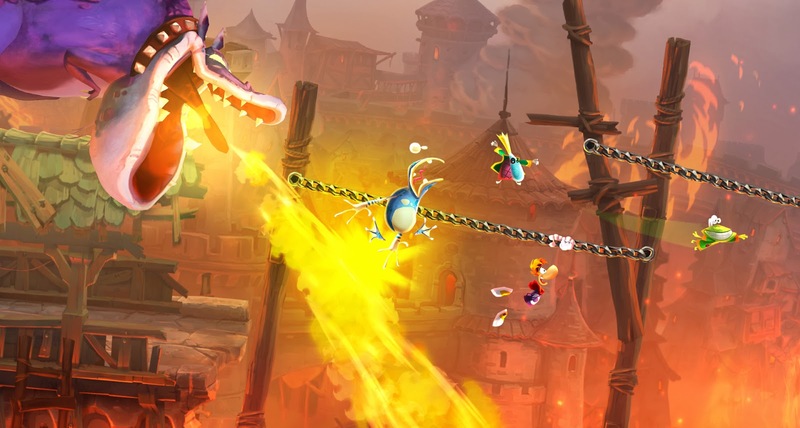 Each of these levels has a licensed song that has been put into the ringer and Rayman-ified. These levels have you constantly running, jumping over holes, enemies, and sliding down ropes in time with the music. 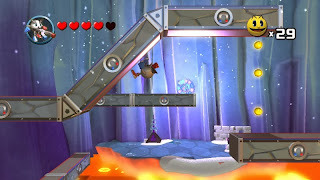 Castle Rock is the first of these levels that players are introduced to. The song that plays during this level is Black Betty. 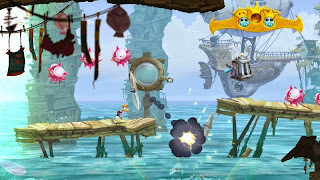 The level itself takes place in a medieval setting, with Rayman and the gang leaping over enemies that pop up right on cue with the music, singing along with the music in such a perfect fashion. 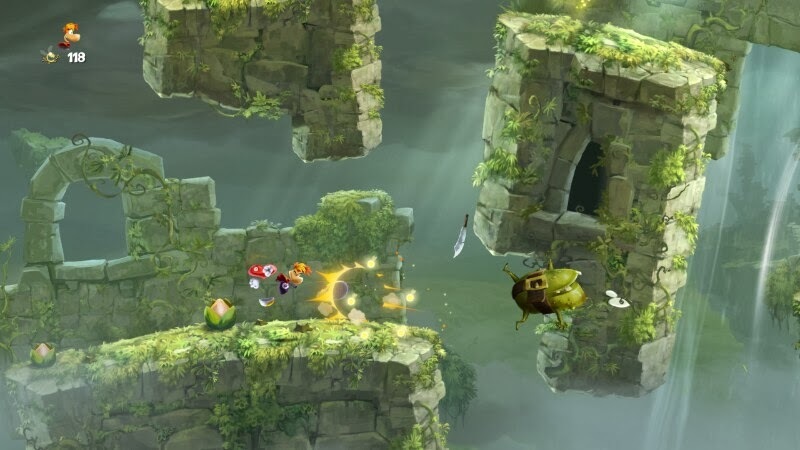 While it may sound all like fun and games, Rayman has to survive the entire level. He's chased by a fire-breathing dragon who definitely needs some exercise, he has to slide down ropes, and he has to run along rooftops and through various castle towers. We don't think words do these music levels justice, so click on this link to see Castle Rock in action for yourself. Welcome to a nighttime installment of SuperPhillip Central's Favorite VGM, where we pick our most cherished and enjoyed themes from various video games. No system, no series, no game is off-limits! 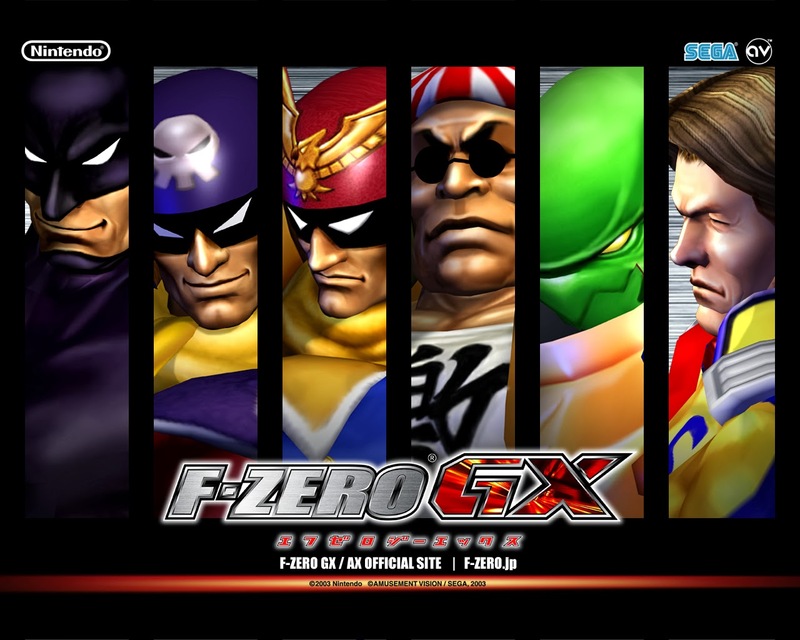 On this week's edition of the ol' Favorite VGM, we have music from Final Fantasy Tactics Advance, Shadow the Hedgehog, and F-Zero GX. We have fantastical games and even some more "serious" fare. 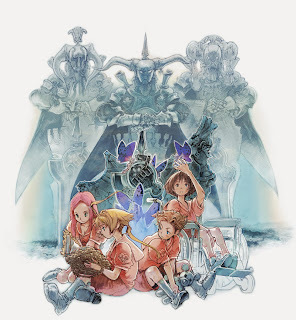 Can you imagine hearing this theme and strolling the grand countryside of Ivalice? We sure can. Hitoshi Sakimoto and Nobuo Uematsu teamed up to work on the soundtrack of Final Fantasy Tactics Advance, a game that many Nintendo fans welcomed with open arms. After all, then-Squaresoft hadn't worked on a Nintendo platform for almost a decade. 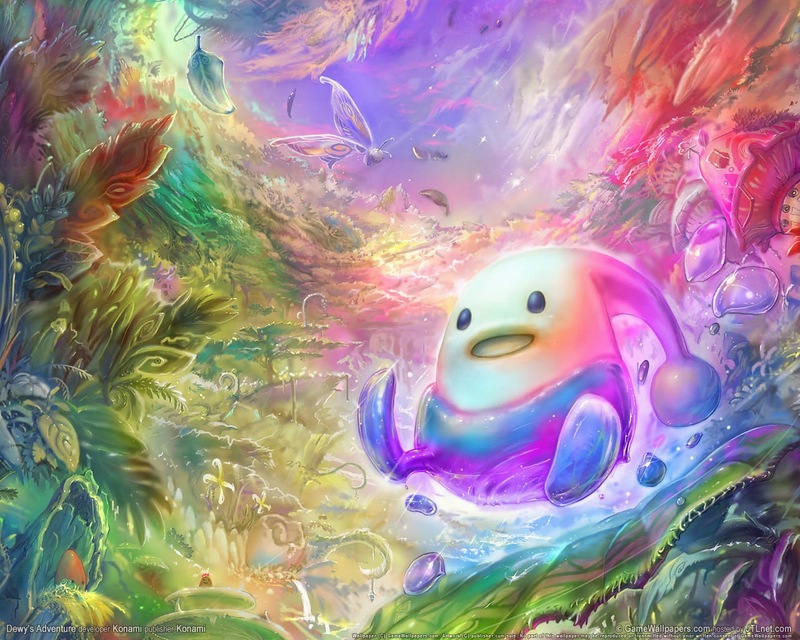 Catchy, infectious, and cute, Strawberry Date is the main theme of the overlooked Wii platformer Dewy's Adventure. 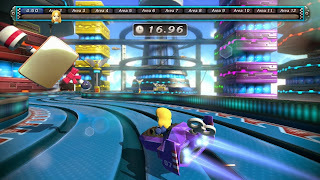 The game was created by the team behind Elebits, another Wii title. 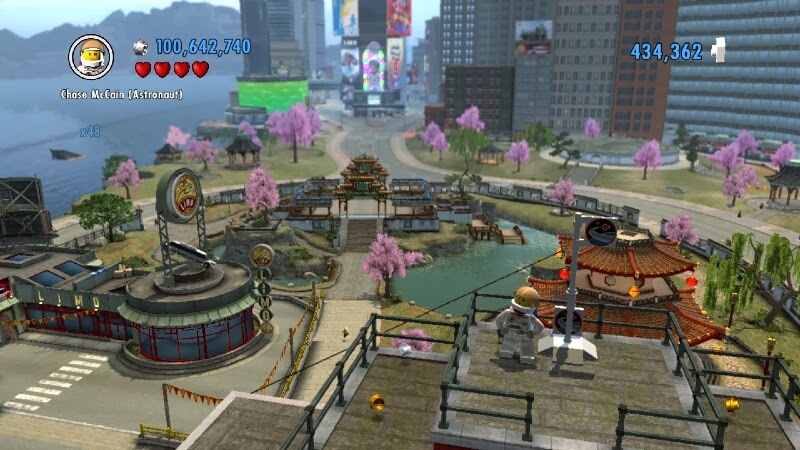 You tilted the Wii Remote to move Dewy around many themed environments. It was quite the charming game that is definitely worth a look. 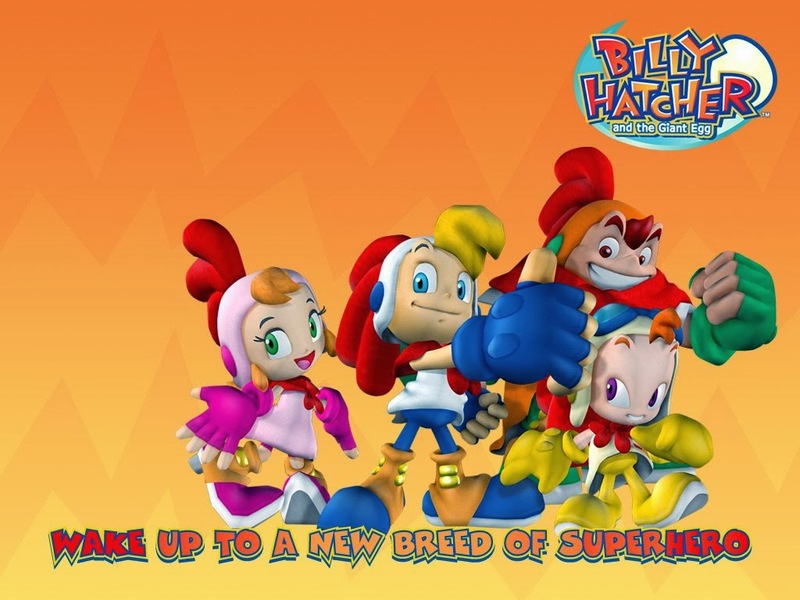 We've already featured two other themes from Billy Hatcher and the Giant Egg. This one, Chant This Charm, is the ending theme, played during the credits. The day has been saved, the chickens are all safe, and we can enjoy this light vocal song. Sure, we didn't get to the end of the game because it wasn't very good, but at least we can enjoy the music! Back in the day we were much more patient gamers. For example, we beat Shadow the Hedgehog 100%. Yes, even the hard mode. Now that we're older (maybe a little wiser), have more responsibilities, and have more games to review, if a game is bad, we probably won't torture ourselves to beat it 100%. 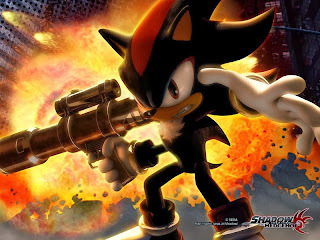 Shadow the Hedgehog is one of those games that we wouldn't complete nowadays. Still, the heavy focus of rock featured throughout the soundtrack fit the mood of the game and was just fun to listen to. You've survived the twists and turns of Mute City, you've crossed the finish line, and you've won first place. This theme welcomes you to the winner's circle as you make your F-Zero pilot makes his or her (or its) way for one last victory lap. The techno music and rock guitar make for a delightful and awesome combination. Victory is yours... Stand up and enjoy it! Today is Monday, November 18. A year ago on this very same day, Nintendo's Wii U launched here in North America. (It's also the 12-year anniversary of the GameCube, as well, but that's for another day.) To celebrate, we are taking a look back at some of the most engaging, entertaining, and enjoyable Wii U retail titles released from the Wii U's launch to now. Will your favorites be listed? It certainly hasn't been an easy first year for the Wii U, but despite its sales problems, the system has entertained us on many occasions with the following list of games. 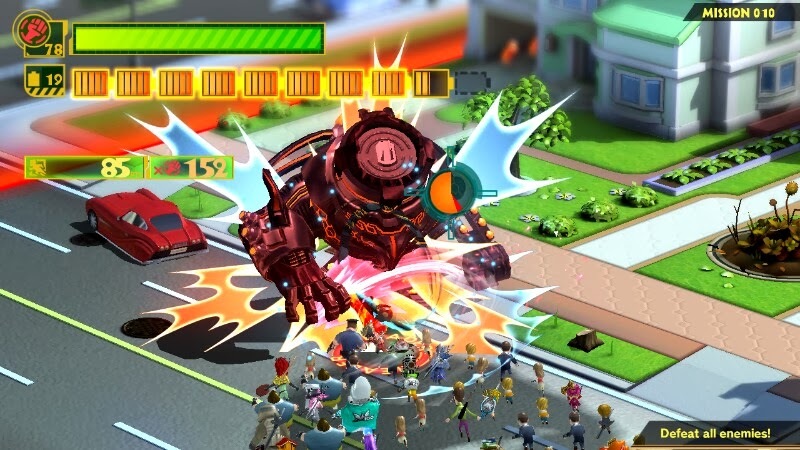 The criminally underrated first project from Platinum Games on the Wii U, The Wonderful 101 featured a rather steep learning curve to get used to the controls. We think it is something that many reviewers did not take the time to do, which is understandable, as they have many games on their proverbial plate to play. Regardless, for those who stuck with the game, they found an increasingly crazier, action-packed, depth-filled mass hero game that did not take itself seriously whatsoever. 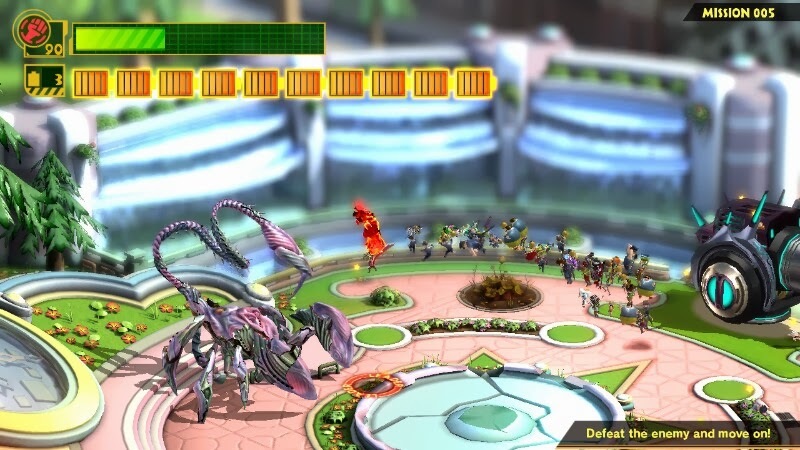 Taking on huge GEATHJERK enemies with your 100 heroes, using the GamePad's touch screen and right analog stick to transform your group into different forms, and participating in an ever-escalating campaign were all events The Wonderful 101 presented players with. There's a reason many people who have played the game recommend it as one of the Wii U's best. 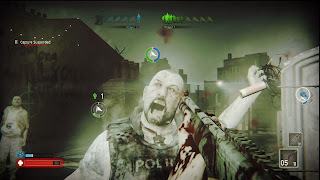 One of the few games to get us legitimately fearful, ZombiU comes across as just another first-person shooter at first, but shooting isn't as commonplace (or as smart) as you might think. Shooting makes noise. Noise brings zombies. Zombies want to kill you. You want to survive. ZombiU was all about surviving the horror that hit England, requiring players to be resourceful like MacGyver during the zombie apocalypse. (Okay, we don't think that was an episode, but we sort of stopped caring after he quit being a cool action hero who ventured the world.) ZombiU is still one of the few games that make sensational use of the Wii U GamePad, one that lends itself well to the gameplay. 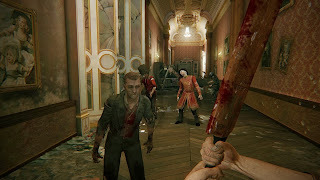 Fumbling through your backpack in real time, not knowing if a zombie will come and attack during is one seriously scary proposition for one seriously scary game. The Wii U cannot say it has the definitive version of many games. Whether that is due to the hardware's power or the effort of third-parties is a question that we aren't capable of answering ourselves. Regardless, one of the terrific third-party ports for the Wii U (albeit really late and at full price while the other versions were very cheap) was from EA of all publishers. Criterion, the developer, put a lot of love and effort into Need for Speed: Most Wanted U, and it shows. 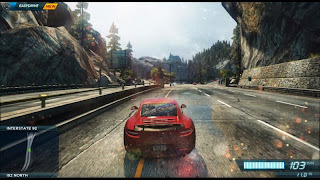 The game runs well, possesses plenty of Wii U-exclusive features, such as switching between cars, time of day, and traffic conditions via the GamePad screen, and the online is well done, too. 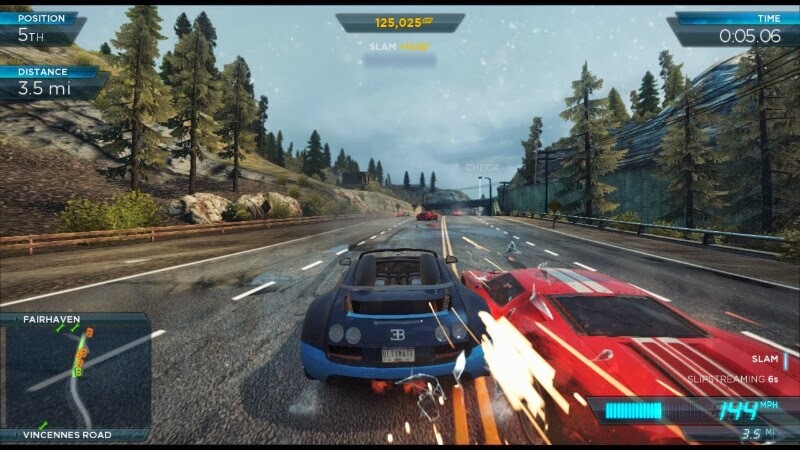 For speed demons and connoisseurs of cars alike, Need for Speed: Most Wanted U is worth taking a test drive with. 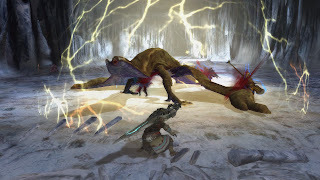 The former Wii U exclusive was delayed to release at the same time as the PlayStation 3, Xbox 360, and PlayStation Vita ports. The initial news stung for Wii U owners like us who were dying for something new to play. Regardless, the nine month wait was definitely worth it. The level of creativity and imagination exhibited by Michel Ancel and his team knows no bounds in Rayman Legends, whether it be in the enjoyable musical levels, the best-on-Wii-U Murfy segments, or the Invasion levels. 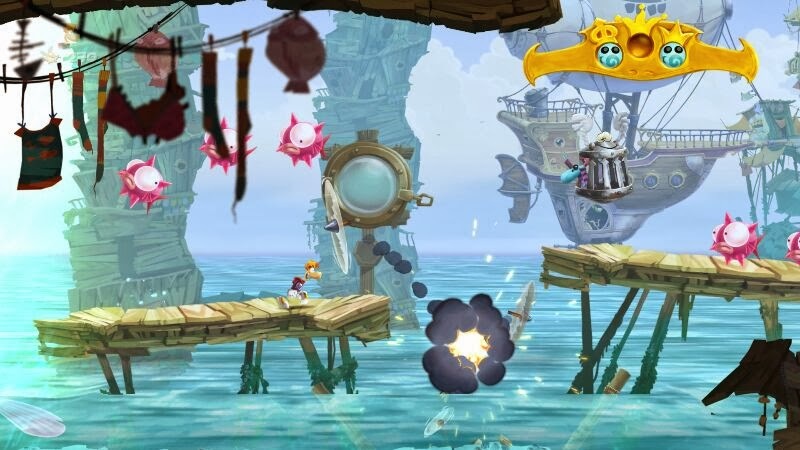 The addition of past haunts from Rayman Origins made for a package that was immensely enjoyable. 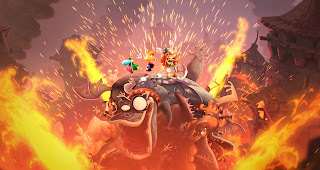 While Rayman Legends showcased a lot of new ideas and great use of the Wii U GamePad, on a purely design level, New Super Mario Bros. U surpasses it in quality. Everything feels tighter, more polished, and better in multiplayer. Including a Challenge mode and Boost mode added some variety to the game, so that beginners and veterans alike could enjoy the game together. 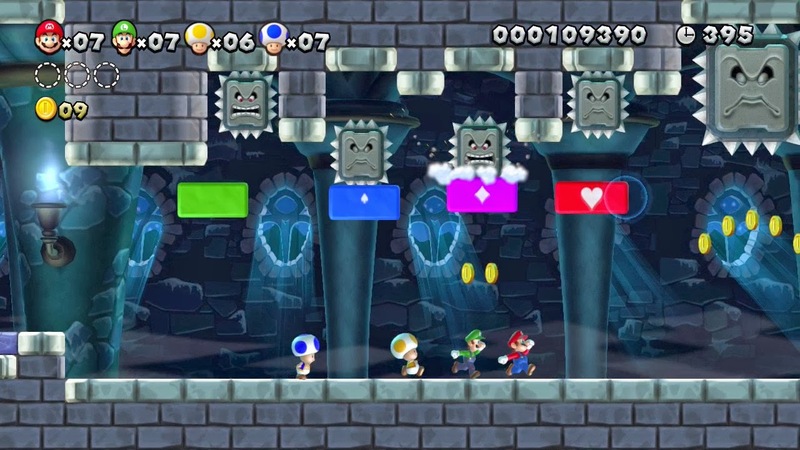 We're certain that if New Super Mario Bros. U had incorporated a better art style as opposed to its plastic toy look and better quality music (see: something new), many would have a higher opinion of this game. We were very hesitant to get excited for yet another mini-game collection, but after playing Nintendo Land we feel that the term "mini-game collection" does a disservice to Nintendo's creative package showcasing the many talents of the Wii U GamePad. In fact, each of Nintendo Land's twelve games could be called mega-games, as they have a lot of content. 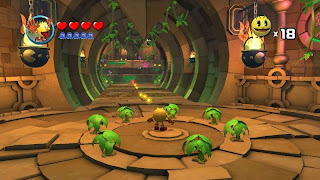 From chasing a Mii decked out in Mario's clothing as a brigade of Toads pursue him in Mario Chase, to oh-so-carefully tilting the GamePad in order to not break the egg laying within the cart in Donkey Kong's Crash Course, there was a lot of content to enjoy either alone or with friends/family. The icing on this enticing cake was the various nods to Nintendo's history via prizes and remixed music. Similar to The Wonderful 101 in that this game has a steep learning curve that once conquered, players will be given a highly rewarding experience, Monster Hunter 3 Ultimate was an updated port of the Wii's vanilla Monster Hunter 3, giving hunters around the world more content in the form of new monsters to take down. The improved high-definition visuals might not be the best on the Wii U (nowhere close actually), but they certainly did not hurt the eyes. 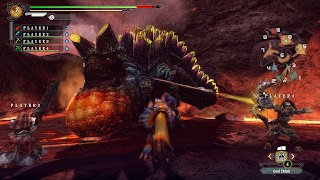 The single player story mode was interesting enough, but hopping into an online lobby and battling creatures like Lagiacrus and Rathalos with up to three other buddies or total strangers made for an even more exciting time. 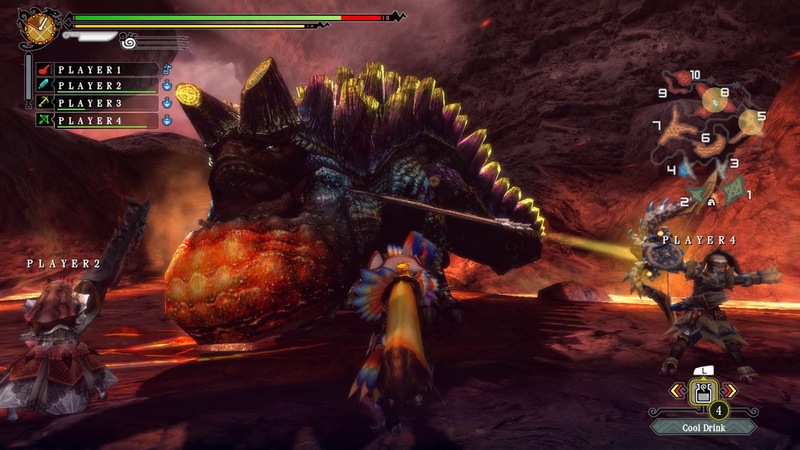 With Monster Hunter 3 Ultimate, the thrill of the hunt was taken into the HD era. 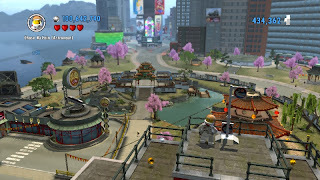 Beneath its meager difficulty and accessible appearance there lies in LEGO City Undercover one of the most entertaining open world sandbox settings in quite a long time. 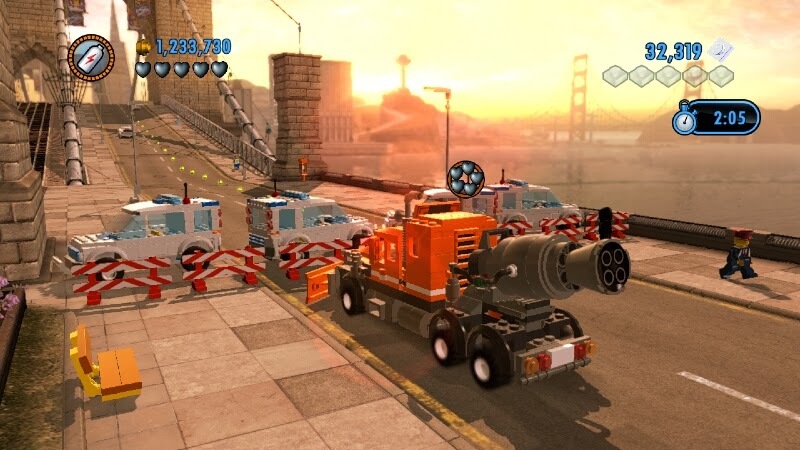 LEGO City was absolutely loaded with activities to do on every street corner, with new character and vehicle tokens to unlock, sections of the city for each of protagonist Chase McCain's various disguises to take advantage of, and cars to... uh... "borrow." Add all of that to the game's charming characters (Frank Honey, yes?) and humorous story, filled with plenty of references to pop culture, and you have a game that came from out of nowhere to be loved by the entire SuperPhillip Central crew. We were going to place The Legend of Zelda: The Wind Waker HD as number one on our list today, but we figured we'd give a wholly new game that honor rather than a remake. 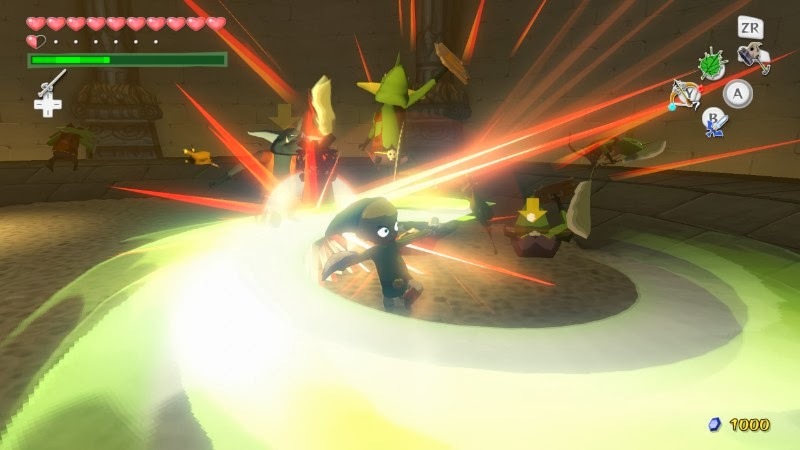 That said, The Wind Waker HD is one heck of a remake, fixing many issues players had with the GameCube original. 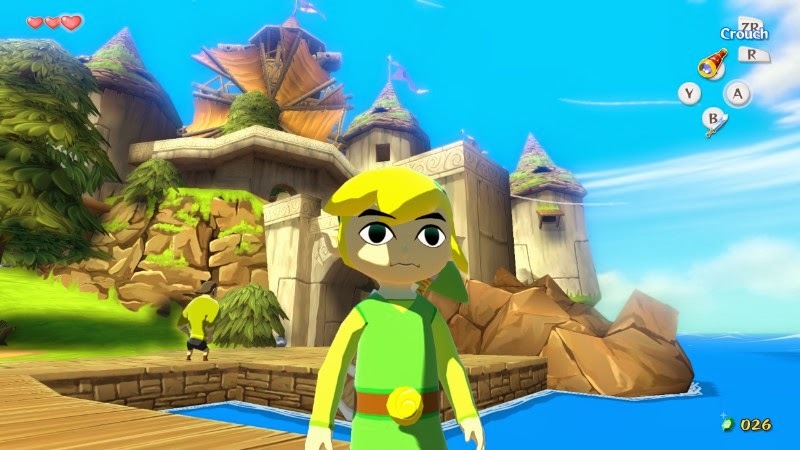 Such fixes included adding an unlockable Swift Sail to make sailing less tedious and problematic, as well as retooling the infamous Triforce Quest to make it more enjoyable and less of a hassle. Then there's those visuals, which are some of the most impressive on any platform. The characters display a plethora of emotions, the world is richly detailed, and the entire package could easily be misconstrued for a cartoon. The Legend of Zelda: The Wind Waker was a phenomenal game, but this Wii U HD remake makes it even better. Nintendo fans had been waiting a long time for the third installment in Shigeru Miyamoto's Pikmin franchise. The end result was most certainly worth waiting for. 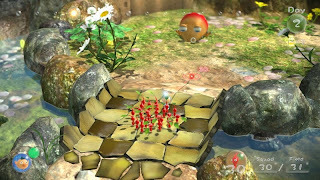 Pikmin 3 introduced the concept of having three different captains, able to be split up and assigned different tasks for maximum efficiency. Proficient players could divvy up the tasks to play through the game in as few game days as possible. The goal of the game was to have your Pikmin army defeat enemies, solve environmental puzzles, proceed through the various areas of the game, and collect fruit as a team. 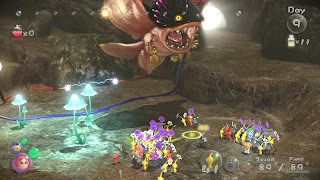 The addition of Mission Mode and Challenge Mode meant more content for Pikmin 3 players to enjoy, and subsequent DLC has done that, too. Pikmin 3 is a modern masterpiece, and showcases just how much talent Nintendo still possesses.